Today, the National Association of ACOs (NAACOS) released results from a survey about assuming risk and future participation plans for Medicare Shared Savings Program (MSSP) Track 1 ACOs. The web-based survey was conducted in April 2018 and survey links were emailed to Track 1 ACOs entering their third agreement periods in 2019. NAACOS specifically reached out to the 82 ACOs that began the MSSP in 2012 or 2013 and remain in Track 1 in 2018, thus they are required to move to a two-sided ACO model in their third agreement period beginning in 2019. The goal of the survey was to better understand what ACOs are planning in the face of these requirements and how they feel about risk. While we are pleased that 43 percent of these Track 1 ACOs responded to the survey, we are troubled by the results which illustrate NAACOS’s long-standing concerns about forcing ACOs into risk-based contracts. 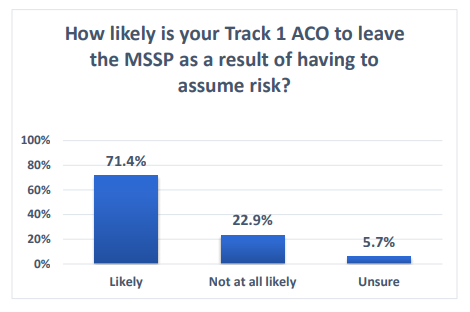 As seen in the graph below, results from a key survey question show that 71 percent of ACO respondents indicated they are likely to leave the MSSP as a result of having to assume risk. While this survey focuses on a select group of ACOs facing risk requirements for 2019, forcing ACOs into risk will become an annual issue as more ACOs move through their second agreement periods. It would be devastating to see ACOs quit the program year over year as a result of risk requirements, especially considering the progress we are starting to see from ACOs. For example, MSSP ACOs that earned shared savings in 2016 had a significant decline in inpatient hospital expenditures and utilization as well as decreased home health, Skilled Nursing Facility, and imaging expenditures. MSSP ACOs subject to pay-for-performance quality measures earned an average quality score of 95 percent in 2016. Additionally, ACOs participating over a longer period of time show greater improvement in financial performance. For example, 42 percent of MSSP ACOs that started the program in 2012 earned savings in Performance Year 2016 versus 18 percent of those that began in 2016. Finally, research shows that ACOs are reducing costs relative to their peers in strictly fee-for-service payment. Results such as these are promising especially given the steep learning curve early ACOs faced, the magnitude of the clinical and operational transformations they are undertaking, and the challenges of dealing with evolving program requirements. The Likely category represents a composite of selection choices (Completely Likely (8.6 percent), Very Likely (20 percent), Moderately Likely (11.4 percent), and Slightly Likely (31.4 percent).